Black Sea (Чорне море; Chorne more) (Map: Northern Black Sea coast). An interior sea connected to the Atlantic Ocean by several straits and the Aegean and Mediterranean seas. It lies between the East European massif in the north and Asia Minor in the south, between Caucasia in the east and the Balkan Peninsula in the west. 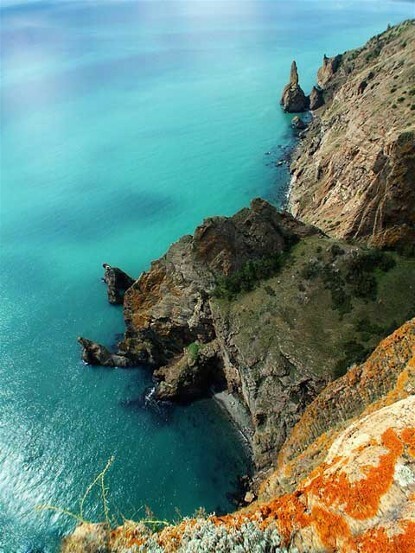 The coasts of the Black Sea and the Sea of Azov form the natural boundary of the Ukrainian territories in the south. Today the Black Sea coast is divided among Ukraine, the Russian Federation, Georgia, Turkey, Bulgaria, and Romania. The Black Sea is the only natural boundary of Ukraine. It also links Ukraine with the world. Since ancient times economic, political, and cultural influences from the south have reached Ukraine via the Black Sea. They easily penetrated to the interior of Ukrainian territory along the rivers that flow into the sea: the Danube River, Dnister River, Boh River, and particularly the Dnipro River. The Dnipro and the Varangian route were the main arteries of Kyivan Rus’ and linked the Black and Baltic seas. Most of the ancient cities of the Kyivan state were located along the Dnipro and its tributaries. For many centuries three expansion routes intersected on the north coast of the Black Sea. The peoples that inhabited Ukraine tried to reach the Black Sea, while the Mediterranean peoples—Greeks, Byzantines, Italians—strove to occupy its most northerly coast. But the steppes along the northern coast were continually invaded by nomadic hordes from Asia, who sought to push back from the Black Sea the inhabitants of the steppes, such as the Cimmerians and Taurians, and wanted to destroy the colonies of the Mediterranean peoples. The struggle for the northern coasts of the Black Sea and the Sea of Azov lasted for centuries. For this reason the Ukrainian people established a permanent boundary on the Black Sea fairly late—only at the close of the 18th century. The present ethnic boundary of the Ukrainian people on the Black Sea can be divided into four sections: from the mouth of the Danube to the Crimea, the Crimean region up to the Kerch Strait (both these sections belong to Ukraine), the Kuban region up to the town of Dzhubga (this section belongs to the Russian Federation), and from Dzhubga to the city of Gagra (a mixed Russian-Ukrainian region, which is now Russified). The Black Sea was known under various names in the past. The ancient Greeks called it at one time Pontos Axeinos (the Hostile Sea), because of its storminess and lack of islands. After colonizing its coast, the Greeks renamed it Pontos Euxeinos (the Hospitable Sea). Arab travelers and writers called it the Rus' Sea. 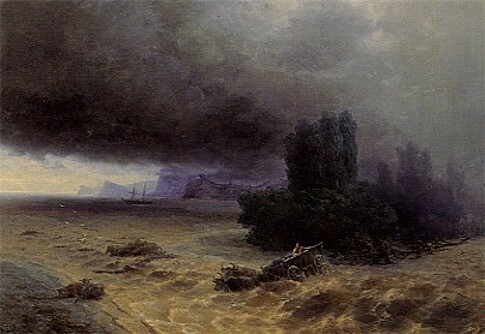 The Kyiv Chronicle referred to it as the Pontic or Ponetian Sea. Eventually, various nations adopted the name Black Sea, usually translated into their own language (for example, Karadeniz in Turkish). The name may have been derived from the color of the water at great depth or from the sea's storminess. The Black Sea has a more or less oval shape. Its longitudinal axis is about 1,150km long, and its latitudinal axis is 611km. The sea surface has an area of 423,000 sq km. The average depth is 1,300m, and the greatest depth is 2,245m. The volume of the Black Sea is 547,000 cu km. Geological history. The Black Sea is considered to be a residual basin of the Central European Tethys Sea, which existed from the end of the Paleozoic era to the Middle Tertiary period. As a result of alpine orogenic movements in the Triassic period, the Tethys Sea became divided into a series of basins. One of them was Pontus, stretching from Moldavia in the west to the Aral Sea in the east. At the end of the Tertiary period this basin separated from the Caspian Sea and shrank to the dimensions of the present Black Sea. During the Ice Age of the Pleistocene epoch, the level of the Black Sea rose, and the sea was connected to the Mediterranean and Caspian seas several times. But in the postglacial period the Black Sea contracted, became a freshwater sea, and its water level fell below that of the ocean. The Strait of Bosporus was formed 6,000-8,000 years ago. 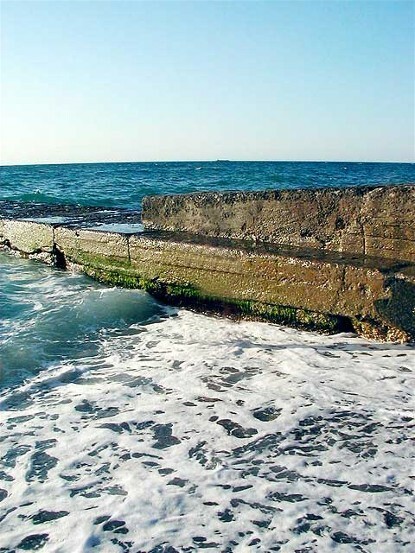 The salt water of the Mediterranean Sea entered the Black Sea and filled its basin. It destroyed the freshwater fauna of the Black Sea, which came to be replaced by the saltwater fauna of the Mediterranean Sea. The sea level rose, and the salt water flooded the lower parts of the river valleys, creating limans. Morphology. The submarine relief of the Black Sea consists of three concentric rings: the continental shelf, the continental slope, and the basin's core. The continental shelf is the outer, coastal ring, less than 200m in depth. It slopes gently away from the coast and is covered with terrigenous deposits from mountains. 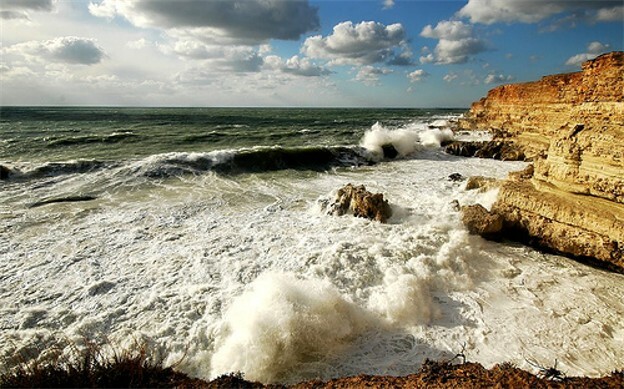 It covers about one-quarter of the sea's area and is widest in the northwest and at the Kerch Strait. The continental slope is the ring separating the continental shelf and the basin's core. The incline of the slope usually varies between 5° and 6°. At a depth of about 2,000m the incline of the slope suddenly decreases, and the slope merges with the basin bottom. The surface of the slope is usually very uneven and is covered with a layer of sticky mud, black on top and light gray underneath. The color is due to ferrous sulfide, which is deposited in the form of very fine grains or thin needles. The basin's core, the deepest part of the sea, covers about one-third of the sea's area. It is a flat and featureless plain that descends very gradually to its lowest point of 2,245m in depth. It is constructed of Precambrian deposits interlaid with layers of basalts and granites and covered with a thin layer of very fine silts. There are scarcely any islands in the Black Sea. Dovhyi Island, Berezan Island, near the estuary of the Dnipro River, and Zmiinyi Island, near the delta of the Danube River, are tiny in size. The coast. The coastline of the Black Sea is quite even, except for the Crimean Peninsula, which juts out from the northern coast towards the south and divides the sea into a western and an eastern section. 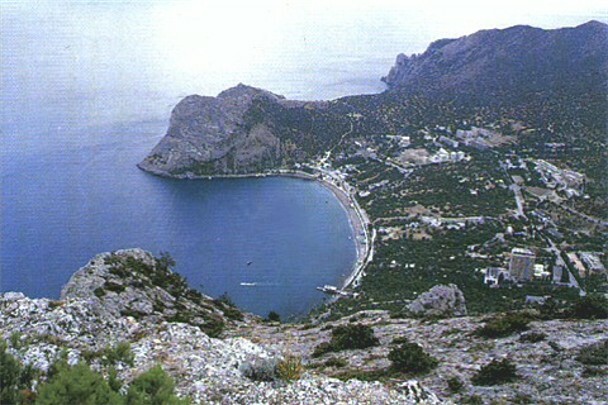 The northwestern coast of the Crimea and the southern shore of the continent enclose the only large bay—Karkinit Bay. 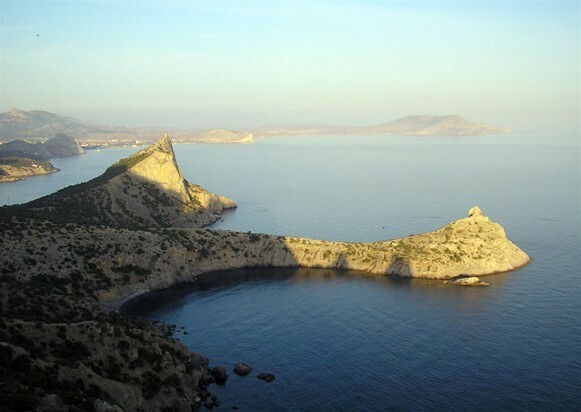 The other bays are Kalamitska Bay, on the southwestern coast of the Crimea, and Teodosiia Bay, on the southeastern coast of the Crimea. The northwestern coast of the Black Sea is low and intersected by rivers, the largest of which are the Danube River, Dnister River, Boh River, and Dnipro River. The Danube Delta is low and muddy. Steep cliffs of the Black Sea Lowland, intersected by ravines and limans, stretch north from the Danube to the mouth of the Dnipro. The largest limans are those of the Dnister, Boh, and Dnipro rivers, and they are connected with the sea. Smaller limans lose so much water by evaporation that they form closed saline lakes. East of the Dnipro Estuary the cliffs gradually diminish and turn into gently sloping sand beaches. On this part of the coast the largest spit—Tendriv Spit—is located. 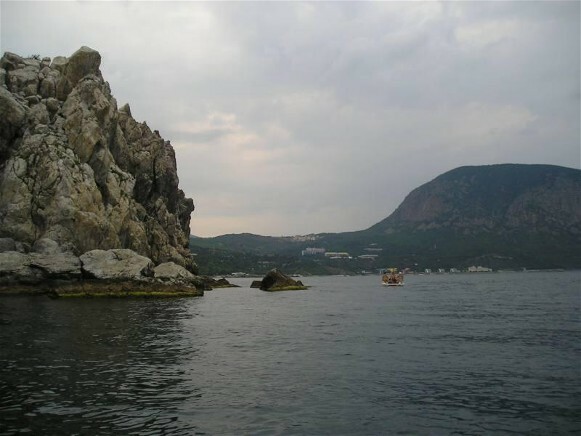 The northwestern coast of the Crimea is low and abounds in lakes and lagoons. 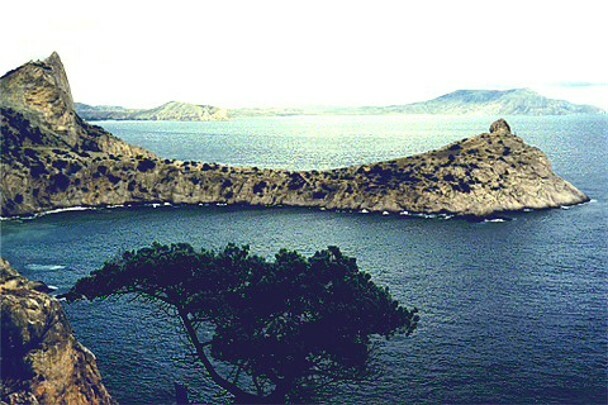 The southwestern coast of the Crimea runs perpendicular to the Crimean Mountains. It is partly submerged and forms a picturesque riss shore. 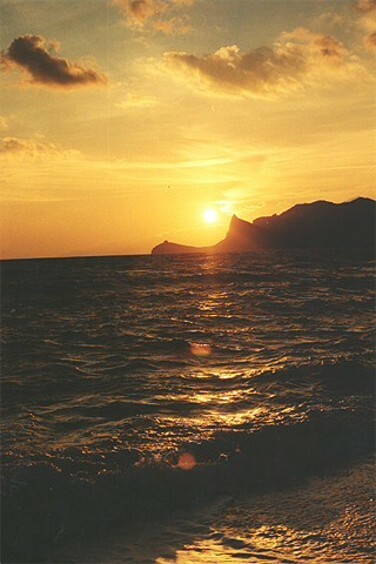 The southeastern coast of the Crimea runs parallel to the mountains, which fall steeply into the sea. A narrow beach stretches between the mountains and the sea and widens out somewhat at the mouths of mountain streams. The eastern coast of the Black Sea is at first low and flat along the Taman Peninsula and then becomes mountainous towards the south. Climate. The climate of the Black Sea is predominantly continental. 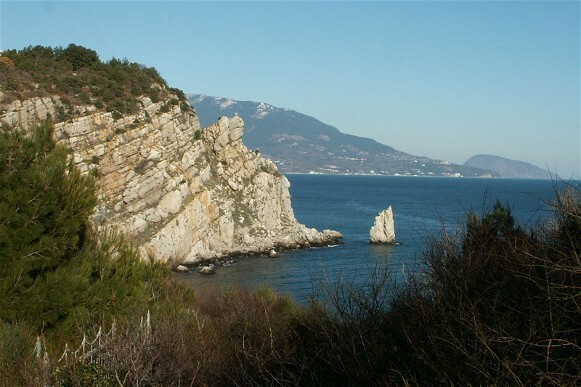 Only the southern coast of the Crimea and the northwestern coast of Caucasia are protected by mountains from the cold north winds and are visited by the mild winds of the Black Sea. Hence, they have a mild Mediterranean climate. The Atlantic Ocean has a great influence on the climate of the Black Sea. 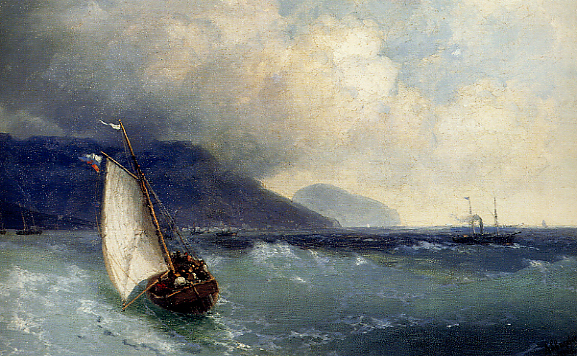 In winter northeast winds usually prevail over the sea, lowering the temperature and causing frequent storms. On the northeastern coast, near Novorossiisk, cold and violent mountain winds develop. The temperature of the northern part of the Black Sea averages about -3°C in January, but it occasionally falls as low as -30°C. The coastal waters freeze up for a month or more, while the shallow bays, river mouths, and limans freeze up for two to three months. During this season the southern coast of the Crimea and the sheltered eastern coast enjoy a temperature of 6-8°C, well above the freezing point. The average July temperature in the north is 22-23°C and, in the south, 24°C. The northwestern coast has the lowest annual precipitation (300 mm), and the Caucasian coast has the highest (up to 1,500 mm). Sea water. (See map: Black Sea. Water and Water Movements.) 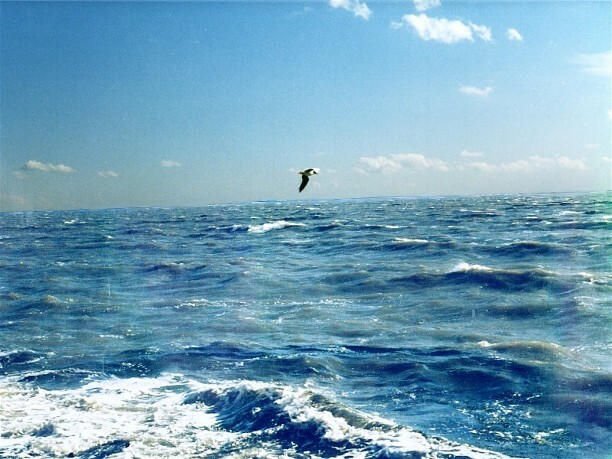 The average volume of water in the Black Sea is 547,000 cu km. The volume changes depending on the following factors: precipitation, which is usually 230,000 cu km; the inflow from the continent - 310,000 cu km; the flow from the Sea of Azov - 25,000 cu km; evaporation loss - 357,000 cu km; and outflow through the Strait of Bosporus - 208,000 cu km. Because of the Black Sea's relatively young geological age and the huge inflow of fresh water from the rivers and semifresh water from the Sea of Azov, the salinity of the Black Sea is almost 50 percent lower than the salinity of the ocean. It is lowest in the northwest (13 parts per thousand) and increases to 17-18 parts per thousand elsewhere. The salinity varies also: it is lowest at the surface and increases with depth to about 23 parts per thousand at 730 m, beyond which it remains almost constant. 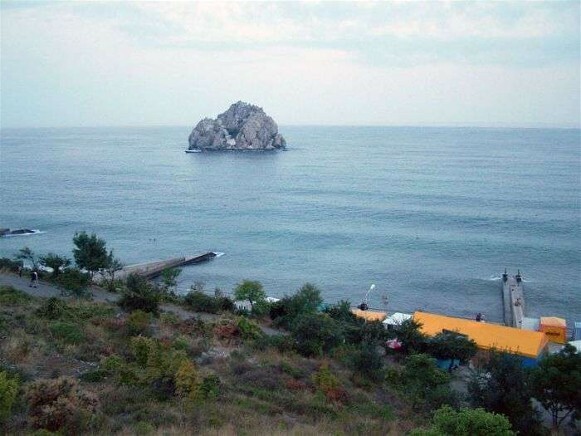 By temperature the waters of the Black Sea are divided into two unequal layers: the upper layer, which extends to a depth of about 500 m, and the lower layer, from 500m to the bottom. The lower layer maintains an almost constant temperature of 9°C. In winter the temperature of the upper layer increases with depth, and in summer it decreases with depth. The vertical temperature changes are uneven. At the surface the temperature is lowest in February: from -0.5°C in the north, where the coastal waters freeze 10–20km offshore, to 5–8°C in the south. The waters reach their highest temperature in August—from 20°C in the north to 25°C or more in the south. 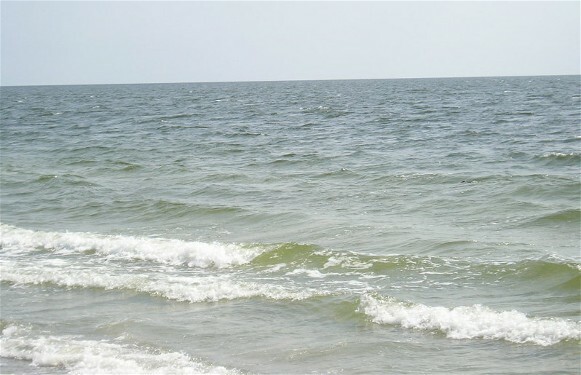 In the Sea of Azov the waters reach 26–27°C, and even 30°C in the limans. The water density depends on salinity and temperature. It is lowest at the mouths of rivers and the Kerch Strait—1.010–1.014 g/cc on the average—and increases towards the open sea and downward—it is 1.017 g/cc on the average at a depth of 150 m and almost constant below that depth. Oxygen is the most important gas in the seawater for it supports organic life. In the upper layer it reaches 4–7 cc per liter. The quantity of oxygen decreases rapidly with depth: at 200 m only 0.5 cc is found in a liter of water. This is not sufficient to sustain life, and hence only a few bacteria (Microspira aestuarii) live at this depth. 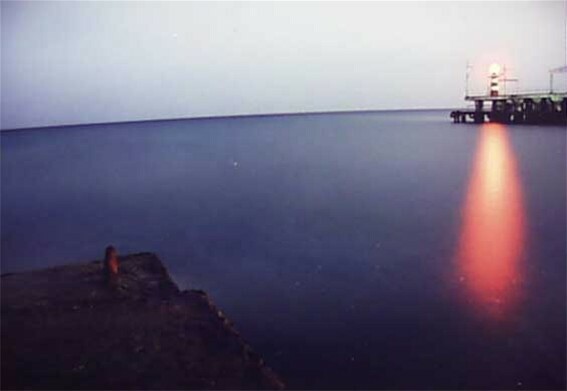 Another obstacle to life below 200 m is the high concentration of hydrogen sulfide, which increases to 6–7 cc per liter at a depth of 2,000 m.
The transparency of the water in the Black Sea is 16–22 m of depth on the average. 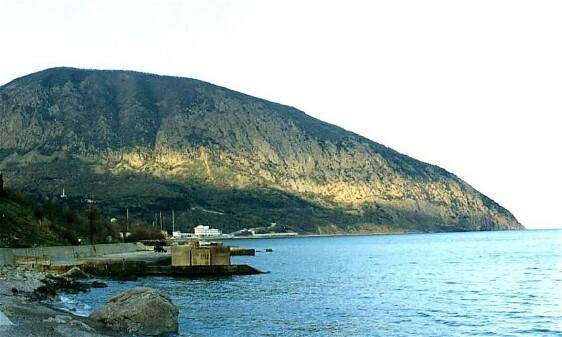 It is lowest near the shore (2–3 m) and highest at the middle of the sea (20–27 m). Water movements. The surface of the Black Sea is usually quiet, but waves arise in windy weather, particularly in wintertime. During storms the waves can reach a height of 15 m or more and present a threat to small vessels. The tide is almost imperceptible, for it reaches scarcely 10 cm in height. There are two types of sea currents in the Black Sea: the surface currents, caused by the cyclonic pattern of the winds, and the double currents in the Bosporus Strait and Kerch Strait, caused by the exchange of waters with adjacent seas. The surface currents form two closed circles. The width of the western circle, opposite the Danube Delta, reaches 100 km and decreases towards the south. The velocity of the current is about 0.5 km per hour. The width of the eastern circle varies between 50 and 100 km, and the velocity is 1 km per hour. The double current of the Strait of Bosporus consists of the exchange of waters between the Black Sea and the Sea of Marmara. The less saline and lighter waters of the Black Sea flow as a surface current into the Sea of Marmara at a velocity of 1–2 m per second. 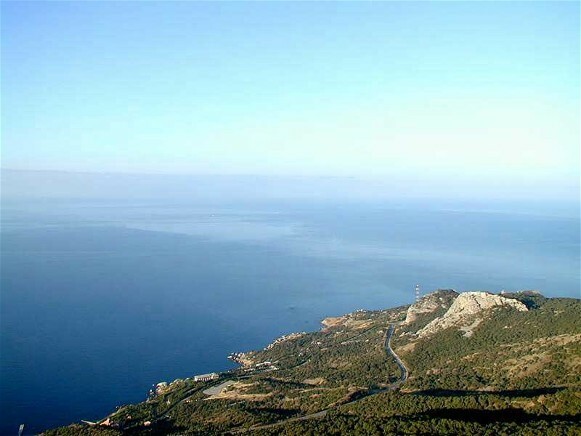 In exchange the more saline and denser waters of the Sea of Marmara flow at a depth of 50–120 m into the Black Sea at a rate of 4–6 m per second. In the Kerch Strait the surface current flows from the Sea of Azov to the Black Sea at 1–2 m per second, while the lower current flows in the opposite direction at a depth of about 5 m.
Besides horizontal currents there are also vertical currents, which are limited to the surface waters down to 200 m.
Flora and fauna. The most peculiar feature of the Black Sea is the absence of marine life at depths beyond 150–200 m, except for a few anaerobic bacteria. Living organisms are concentrated in the shallow waters of the continental shelf and river mouths along the northwestern coast. The plant world consists of phytoplankton (350 unicellular species occur), bottom macrophytes (280 species), several grass species, and sea herbs. The Phillophora rubens herb, which covers over 15,000 sq km of the sea bottom and is harvested in quantities of over five million tonnes, has commercial value. The Zostera sea grass, which is consumed by fish, grows on the silt and sand bottoms of quiet bays. The number of animal species in the Black Sea is small in comparison to the number in the Mediterranean Sea: 350 species of simple creatures, 650 species of crustaceans, over 200 species of molluscs, about 180 species of fish, and 4 species of mammals (the monk seal and 3 species of dolphin). The mammals and fish are of commercial value. The fishing industry brings in rich catches of sturgeon, mackerel, sardine, herring, anchovy, gray mullet, and other fish. History. The northern coast of the Black Sea has had ties with the Mediterranean countries since prehistoric times. As early as the 2nd millennium BC the Phoenicians sailed the Black Sea. At the beginning of the 1st millennium ancient Greek pirates and traders visited the Black Sea and eventually set up trading posts on the northern coast. In the 6th–5th century BC these posts became city states, such as Tyras, Olbia, Kerkinitis (Yevpatoriia), Chersonese Taurica, Phanagoria, and Tanais. The region north of the Black Sea was then settled by the Scythians, who were eventually forced out by the Sarmatians. The economy of the ancient states on the northern Black Sea coast was based on trade in agricultural products, mainly wheat, which were exported to Greece in exchange for wine, oil, and luxury items for the Scythian upper class. The influence of the advanced Greek culture penetrated through these Greek cities to the interior of the East European land mass (for more detail see Greeks). The Greek cities and settlements on both sides of the Kerch Strait formed the Bosporan Kingdom with Panticapaeum as capital in the 6th–5th century BC. In the 3rd–2nd century BC they became part of the Pontic Kingdom and in the 1st century BC part of the Roman Empire. Under Roman protection the region north of the Black Sea enjoyed its second period of economic and cultural prosperity. The invasion of the Goths in the 3rd century AD and the massive migrations of the Turkic-Mongolian tribes from Asia into the Black Sea steppes, as well as the decline of the Roman Empire, led to the destruction of almost all of the Greek cities. The Huns, in the mid-4th century, inflicted the heaviest losses on the cities, and they were followed by the Bulgars, Avars, Khazars, and Ugrians. In the 9th century the Byzantine Empire gained control over the rebuilt former Greek cities in the Crimea. In the early period of Ukrainian history the western part of the Black Sea region was settled by the ancestors of the eastern Slavs, the Antes, followed by the Ulychians and Tivertsians, who are mentioned in the chronicles. The first Kyivan rulers—Prince Askold, Prince Oleh, Prince Ihor, Princess Olha, Prince Sviatoslav I Ihorovych, and Prince Volodymyr the Great—gained and expanded access to the Black Sea and even tried to expand their power by sea by attacking Constantinople in AD 860, 912, and 945. These campaigns led to trade treaties favorable to Rus'. To keep their access to the sea secure, the princes built a number of fortified towns: Oleshnia, at the mouth of the Dnipro River; Peresichen (probably on the lower stretch of the Dnister River and Prut River); a port at the mouth of the Don River; and Tmutorokan, at the mouth of the Kuban River (at the end of the 9th century), which became the capital of the Tmutorokan principality. Sviatoslav's attempt to set up another foothold at the mouth of the Danube River during his struggle with Bulgaria and Byzantium did not succeed. 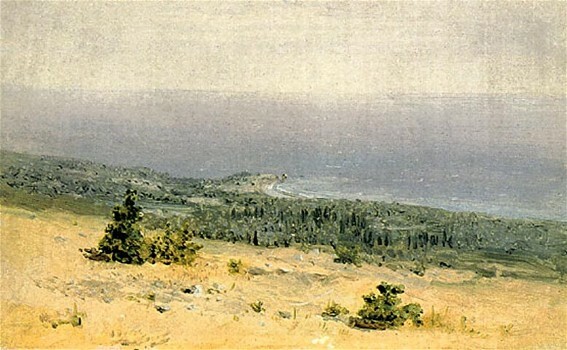 Volodymyr tried to capture the southern Crimea from Byzantium. He succeeded in taking Chersonese Taurica but did not retain control of it. Yet the Kyivan state did gain a natural sea boundary for itself (the first natural boundary of the Ukrainian people), secured trade between Rus' and Byzantium, and opened the door to Byzantine cultural influence in Rus'. The link between the Kyivan state and the Black Sea was weakened by the nomadic hordes that entered the steppes from the east - at the beginning of the 10th century the Pechenegs, then a little later the Torks, and in the mid-11th century the Cumans (Polovtsians). It was difficult for Kyiv to maintain communications with the Black Sea via the Dnipro. By the mid-12th century Tmutorokan was annexed by Byzantium. Halych principality and then the Principality of Galicia-Volhynia had better communications with the sea through the ports of Bilhorod-Dnistrovskyi and Malyi Halych (Galaţi). The invasion of the Tatars and Mongols in 1240–1 cut off Ukraine from the Black Sea, although traces of Ukrainian settlement remained on the coast. Genoese and Venetian colonies appeared on the northern coast of the Black Sea: Kaffa (Teodosiia) and Sudak in the Crimea; Tana at the mouth of the Don River; Bilhorod-Dnistrovskyi (Moncastro, Mauro Castro) at the mouth of the Dnister. Not only West European goods, but also cultural influences, entered Ukrainian territories through these outposts. The Italian cities recognized the authority of the Golden Horde, the new ruler of the Crimea and the steppes along the coast. At the end of the 14th century the Lithuanian prince Vytautas took advantage of the declining power of the Mongols and extended his realm to the Black Sea by annexing a part of southern Ukraine. Ukrainian colonization efforts were renewed. The new strongholds and customs towns—Saintt John's Fort on the lower Dnipro River, forts on the Dnister River and Boh River, the port of Khadzhybei, etc—attracted most of the settlers. These gains were soon lost, however, when the Golden Horde disintegrated and more aggressive hordes such as the Great Horde and especially the Crimean Khanate came to power in the mid-15th century. The khanate established its control over the Crimea and most of the territory along the northern coast. In 1478 it recognized the suzerainty of the new power— the Ottoman Empire (Turkey). In 1453 the Turks took Constantinople and by the end of the century established their control over the Black Sea, which for almost 300 years remained an internal Turkish sea. Turkey ruled the Italian colonies and had suzerainty over Moldavia. The new sea power established the fortresses of Akkerman (now Bilhorod-Dnistrovskyi) and Ochakiv on the Black Sea coast. The Tatars built fortifications on the lower Dnipro. The Black Sea was no longer a window to the world for Ukraine. Because of Tatar incursions a part of the Ukrainian forest-steppe lay desolate, and the line of Ukrainian settlement moved farther from the Black Sea than ever before. To defend themselves the Ukrainian people relied on the Cossacks and particularly the Zaporozhian Sich (est ca 1552). The Cossacks managed not only to defend their territory from Tatar incursions, but also to take the offensive (particularly from 1589 to 1621) and to attack in their light boats (chaiky) the coastal Tatar and Turkish cities: Yevpatoriia, Sinop, Trabzon (Trebizond), and the fortresses at the mouth of the Danube River—Akkerman, Kiliia, and Izmail. The Cossacks even sacked the outskirts of Constantinople. At the end of the 17th century radical political changes took place in the Black Sea basin. Taking advantage of Turkey's decline, Russia waged a series of wars against Turkey and finally gained access to the Black Sea and the Sea of Azov and annexed the Turkish territories along the northern coast of the Black Sea. At first, in 1695, Russia captured the Turkish-Tatar fortresses on the lower Don River, then the fortress of Oziv, which was briefly returned to Turkey in 1711. After three wars—1735–9, 1768–74, and 1787–91— and particularly the Peace Treaty of Küçük Kaynarca in 1774, Russia got control of the territory north of the Black Sea and the Crimean Khanate. In 1812 Russia also annexed the lands between the Dnister River and the Danube River (Bessarabia). The fall of the khanate paved the way for the swift colonization of the Crimea by Ukrainians, Russians, Bulgarians, Germans, and Greeks. At the same time Ukrainian ethnic territories expanded greatly with the annexation of southern Ukraine and the Kuban. After many centuries the Ukrainians won a permanent foothold on a natural sea boundary and a sea link with the rest of the world. In the 19th century the most important historical event in the Black Sea region was the Crimean War. In 1918 the new Ukrainian state included the Black Sea coast from the mouth of the Dnister to Mariupol on the Sea of Azov. The Army of the Ukrainian National Republic occupied the Crimea in April 1918 but abandoned it in response to German demand. This led to Ukraine's loss of the Black Sea Fleet in Sevastopol, which had already raised the Ukrainian flag. During the existence of the Hetman state the Crimea recognized Ukrainian suzerainty, but further events made it impossible to put this suzerainty into effect. From the end of 1918 to the end of 1920 the northern coast of the Black Sea was the battlefield between the Army of the Ukrainian National Republic (only in 1918), the Bolsheviks, the French expeditionary force, Anton Denikin's army, Petr Wrangel's army, and Ukrainian insurgents. By the end of 1920 the whole coast was in Bolshevik hands. The coast was incorporated into the Ukrainian SSR, while the Crimea and the Caucasian coast became part of the Russian SFSR. Romania occupied the coastal region between the Danube River and the Dnister River (Bessarabia) and held it until 1940, when it was annexed by the USSR. During the German-Soviet War of 1941–5, the lands north of the Black Sea were held by German and partly Romanian forces from 1941–2 to the first half of 1944. In 1954 the Crimea was incorporated into the Ukrainian SSR. For a long time the international legal status of the Black Sea straits—the Bosporus and the Dardanelles—and the Sea of Marmara, which connect the Black and the Aegean seas, was undecided. In accordance with the Peace Treaty of Küçük Kaynarca in 1774, Turkey permitted the Russian commercial fleet to use the straits freely. In 1821 all other states got this right. Only Russian and Turkish naval vessels could use the straits. After the Crimean War the Treaty of Paris of 1856 deprived Russia and Turkey of the right to maintain a navy on the Black Sea. With time the naval vessels of the Black Sea countries and, with some restrictions, vessels of other countries appeared on the sea. The status of the straits was determined, with slight changes since then, by the Montreux Convention of 1936. It provided free access to the Black Sea for commercial fleets and, within some limits, for the navies, of countries that do not border on the sea. Transport. 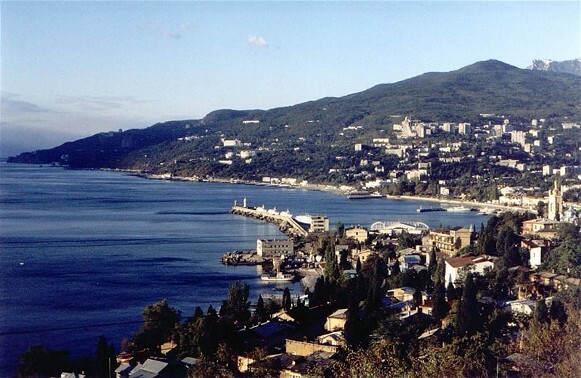 Transport on the northern part of the Black Sea developed at the end of the 18th century, after Russia annexed the northern coast and began to colonize this region. A number of ports were built: Kherson in 1778, Sevastopol in 1784, Mykolaiv in 1788, Izmail in 1790, and Odesa in 1794. In 1828 the first steamships appeared on the Black Sea and ran between Odesa and Yevpatoriia. In 1838 the Black Sea Steamship Association was formed, and in 1856 the Russian Sea Transport Company was founded. The coming of the railway had a great impact on the development of sea transport in the 1860s. Railroads connected Eastern Europe with the sea, and with the opening of the Suez Canal in 1867 the Indian Ocean became accessible to Russian ships. The Russian Black Sea (and Azov) fleet consisted in 1913 of 416 ships, 807 sailing vessels, and 82 motor vessels, with a total gross weight of 473,000 tonnes (42 percent of the total Russian tonnage). Ukrainian ports served mostly foreign ships, particularly Greek ships. Eighty-seven percent of the cargo consisted of exports and scarcely 13 percent of imports, which were brought mainly to Odesa. The main export was grain (45 percent of the total shipped), followed by coal (20 percent), ores (8 percent), sugar (2 percent), metals (2.6 percent), and construction materials. The revolution and civil war of 1917–21 led to the almost total destruction of the Black Sea Fleet: in 1922 it had only 66 ships (5 percent of its prewar number), and in 1925 a total of 2.1 million tonnes of freight was carried (19 percent of the prewar amount transported). Shipping on the Black Sea and the Sea of Azov in 1922 was put under the jurisdiction of the Central Administration for Sea Transport in Moscow. Later the agency was renamed the State Black Sea–Azov Commercial Fleet, and in 1930 it became known as the Black Sea Shipping Administration. After the war, in 1954, it was completely reorganized and was placed under the Ministry of Sea Transport of the USSR. During the five-year plans the Black Sea Fleet was partly restored and modernized. In 1938 it consisted of 167 vessels with a total tonnage of 469,000 tonnes and 200 vessels for local transportation. The freight carried increased from 5.8 million tonnes in 1938 to 10.3 million tonnes in 1940. Up to two million passengers were carried. The proportion of exports to imports increased after the revolution, while foreign trade accounted for one-third of the total (in 1914 it was one-half). The nature of the freight changed: anthracite coal was in first place, oil was second, and grain third, followed by ores, metals, lumber, salt, building materials, etc. During the Second World War half of the Black Sea Fleet was destroyed, particularly in Odesa and Sevastopol. The fleet recovered its prewar strength only in 1950. Since then the capacity of the freight and passenger fleet has been constantly increasing: 19 million tonnes in 1960, 29 million in 1965, 38.2 million in 1970, and 50.3 million in 1978 (ie, 33 percent of the USSR's total shipping and 2 percent of the world total). The fleet is fully modernized. Modern vessels are built at the shipyards of Odesa, Mykolaiv, Kherson, and Kerch (see Shipbuilding) and also in foreign ports. The ports have been modernized, and a large port—Illichivsk—has been built near Odesa. Foreign shipping has increased and is carried on by the Black Sea Fleet, with Odesa as the main port. The growth of shipping is evident from the following figures: 16.6 billion tonne-miles were reached in 1960, 95.0 billion in 1972, and 100.5 billion in 1978. 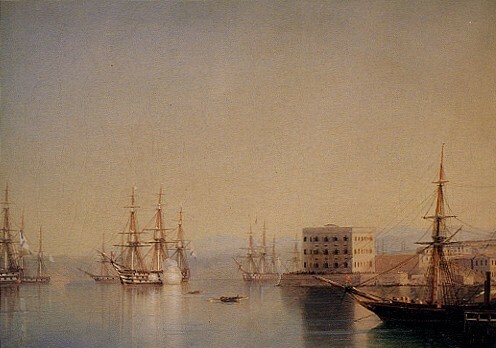 As before the war, Greek, British, French, Italian, and other ships participate in the shipping on the Black Sea. The Dnipro-Black Sea-Danube water route is very important. In the small cabotage the carrying to Odesa of coal from Mariupol, as well as oil and manganese from the Caucasian ports of Poti, Tuapse, and Batumi is particularly significant. Odesa is the leading port for passenger transportation. It is connected by ship via the Black Sea to all the great ports, such as Marseilles, Venice, and Beirut and, via the Danube River, with Budapest, Belgrade, and Vienna. Odesa has been the largest port since the beginning of the 19th century. In 1973 it handled almost 20 million tonnes of cargo, half of which consisted of imports or exports. (See map: Southern Port. The largest cargo consists of oil and oil products, followed by ores, coal, metals, and chemicals. Twenty-five kilometers from Odesa lies the second largest port—Illichivsk—which was built in 1950 as a branch of Odesa but since 1963 has been independent. These two ports handled one-sixth of the freight in the Soviet Black Sea ports. The third largest port is Kherson, at the mouth of the Dnipro River. It is a transfer point for Dnipro sea and railway freight as well as an important passenger terminal. From Mykolaiv manganese ore, iron ore, and coal are shipped. Mykolaiv and Sevastopol serve as naval bases. Also important are the Crimean ports of Kerch, Teodosiia, and Yevpatoriia. The ports of Izmail and Reni are located at the mouth of the Danube River. On the north Caucasian coast, outside Ukraine, the main port is Novorossiisk, which handles mostly oil and cement. The construction of a long water reservoir and hydroelectric station on the Dnister River near Sokyriany, Chernivtsi oblast, opened the region of Subcarpathia to Black Sea shipping. The shipping of oil and its products and the dumping of industrial and residential wastes have created a pollution problem in the Black Sea. To solve this problem and to ease the work of the existing ports, two new ports are under construction: one on the Hryhoriivskyi Liman, 30 km west of Odesa, to handle chemicals and gases, and one in Lazurne (formerly Novooleksiivka) on the sea coast in Kherson oblast. Natural resources of the Black Sea and its coastal region. The Black Sea basin is rich in biological resources. Fish is the most important one, with the annual catch reaching one million tonnes (see Fishing industry). The main fish species are anchovy, sturgeon, beluga, mackerel, mullet, salmon, herring, sardines, flounder, and bullhead. Some iodine-yielding water plants have an industrial use. Some mollusc species are used as feed for domestic fowl. Food-processing and light industries have developed on the basis of these resources. The fish-canning industry has plants in Odesa, Mykolaiv, Kherson, Izmail, and Kerch. 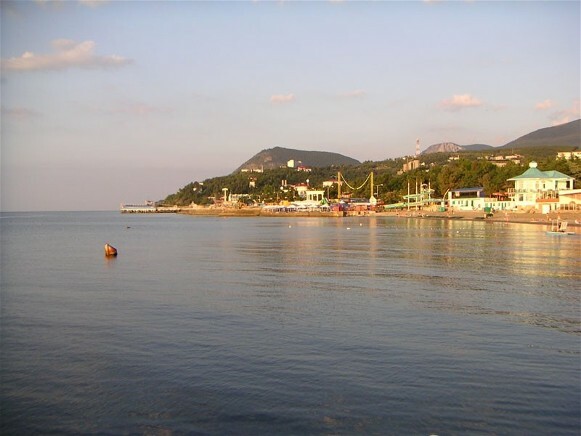 The waters of the limans and shallow bays contain a high concentration of sodium, calcium, and magnesium salts, which are utilized by the Saky Chemical Plant in the Crimea. The saline limans such as Kuialnyk Estuary and Khadzhybei Estuary contain deposits of curative muds. Because of its climate, sandy beaches, picturesque scenery, and curative muds the Black Sea coast is the principal health resort and tourist area of Ukraine and the whole former USSR. Ten to twelve million people visit this area each year. 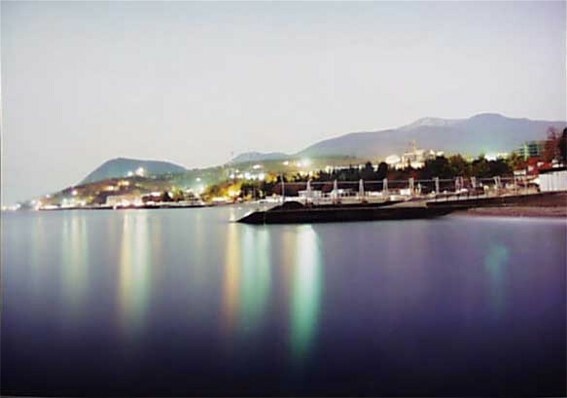 The most important resort belts are the Crimean southern shore with Yalta as its center, the Odesa resort region, the Yevpatoriia region in the Crimea, and the coast of Caucasia. The proximity of coal in the Donbas, iron ore in the Kryvyi Rih Iron-ore Basin and Kerch Iron-ore Basin, and manganese ore near Nikopol, as well as the low transportation costs of other raw materials, account for the rapid industrial development and the high concentration of population on the sea coast. The largest industrial center is Odesa with a population (in 1983) of 1,097,000, followed by Mykolaiv (474,000), Kherson (337,000), Sevastopol (328,000), Kerch (163,000), and, outside Ukraine, Novorossiisk (162,000 in 1980). The Black Sea in Ukrainian political thought, research, and culture. 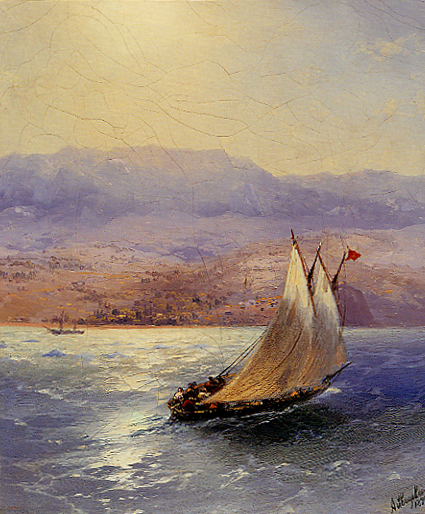 Interest in the problem of the Black Sea developed in Ukraine in the 19th–20th century. At the time of the Revolution of 1905 the idea of an autonomous Black Sea republic with Odesa as capital was popular in south Ukrainian bourgeois circles. During the First World War Ukrainians raised the question of the straits linking the Black and Mediterranean seas. Mykola Sumtsov, for example, took the position that Ukraine ‘can be compensated only with the Strait of Bosporus and the Dardanelles, even without Constantinople' (1917). In leading Ukrainian political circles plans to set up a federation of the states that are connected by the Black Sea were discussed (Mykhailo Hrushevsky's ‘Oriientatsiia chornomors'ka' [The Black Sea Orientation] in his Na porozi novoï Ukraïny [On the Threshold of a New Ukraine, Kyiv 1918]). 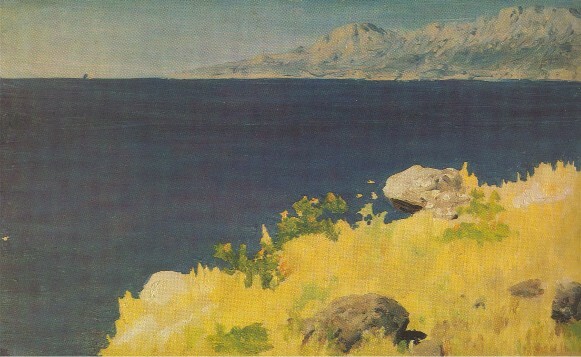 The geopolitical importance of the Black Sea for Ukraine was discussed by Stepan Rudnytsky in Ukraïns'ka sprava zi stanovyshcha politychnoï heohrafiï (The Ukrainian Question from the Position of Political Geography, 1923). Yurii Lypa wrote Chornomors'ka doktryna (The Black Sea Doctrine, 1940) and with Lev Bykovsky and others set up the Ukrainian Black Sea Institute, which in the 1940s published a number of works, including Chornomors'kyi zbirnyk (The Black Sea Collection). 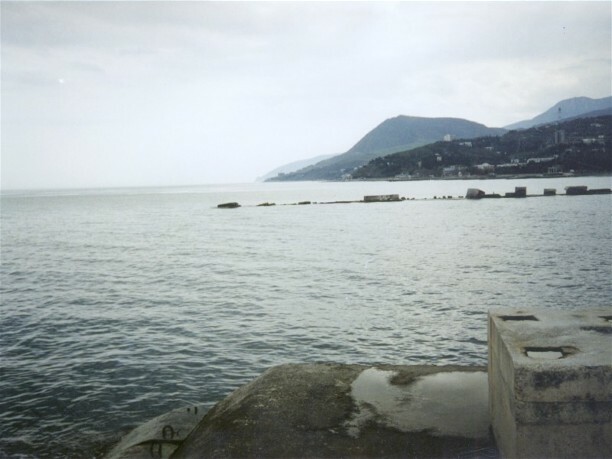 The history of the Black Sea was studied by Ukrainian historians, archeologists, and economists, such as Apolon Skalkovsky, Mykhailo Slabchenko, Serhii Dlozhevsky, Mykhailo Miller, Andrii Kotsevalov, and Mykola Tyshchenko. The Odesa Society of History and Antiquities and the Tavria Learned Archival Commission made important contributions to this field. In the 1920s the Odesa Society of Regional Studies and the Odesa Scientific Society of the All-Ukrainian Academy of Sciences continued to develop this field. Today various scientific institutions conduct research on the Black Sea and its resources, including the Institute of the Biology of Southern Seas of the Academy of Sciences of Ukraine, the Marine Hydrophysical Institute of the Academy of Sciences of Ukraine (both institutes located in Sevastopol), the Azov-Black Sea Scientific Research Institute for Fish Husbandry and Oceanography in Kerch, the Sevastopol branch of the State Oceanographic Institute, and the Black Sea branch of the All-Union Scientific Research Planning Institute of Marine Flora. 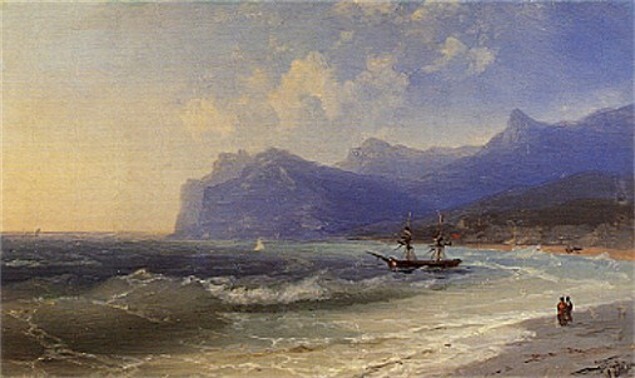 The Black Sea has been a subject in the works of such poets and writers as Taras Shevchenko, Oleksander Oles, Mykhailo Kotsiubynsky, Yurii Yanovsky, and Zinaida Tulub and such painters as Ivan Aivazovsky (eg, The Beach at Koktebel on a Windy Day, Crimea.jpg">Sailing Barge in the Crimea, Sailing Boat off Yalta, Storm), Arkhyp Kuindzhi, Serhii Vasylkivsky, and Oleksa Hryshchenko. A referral to this page is found in 175 entries.